* On the seventh setting I clicked door to see how many wrong remained and I zoned in. Frustrating at first, until I figured out a good system to work it down. Just remember each time you click on the door to test it, it reset back to Tooth 1, and you gotta do it again. I didn't realize this until quite awhile after. But once you start remembering/writing down the right in or out for each tooth, it's very easy to work down the incorrect numbers down until you get it right. Good luck. Set them all to removed, check door. If ONE is wrong, work your way through till you zone. Took me all of 3 minutes to figure the key out this way. "If at first you don't succeed, give up and grab a beer"
"Why the hell won't my eqplayers sig work on alla?!" This key is kinda annoying to work with, I found this way made it faster to set. After every tooth change you need to pause 5 seconds to get to the next tooth, if you click faster you change the (In/Out) setting of the tooth. You need to check with the door to go back to tooth 1. *** What I did I set all the teeth to inserted. Then I clicked the door and was told 5 were wrong, knowing there are only 8 teeth 5 need to be removed. Only change 1 tooth at a time and click the door. EX: remove tooth 1 then click door, if that gets you another wrong one that one needed to be (In)- so round 2 put that one back in and remove 2 repeat until you see the zone message.. Also take notes as you go.. no one seems to have the same key combo so do not waste time trying to match yours to a post you see here you have to do it yourself. **Fun idea -- ANNOYING process -- GL all have fun in MM. ok here is how this works - will take you maybe 10 mins tops to configure your key. Think of your key as one of the old fashioned deadlock Type keys that have a barrel shaped handle and a square/rectangular tab at the end. Now think of the tab being divided into 8 paralel teeth. When you get your key the teeth are all set in a middle position - none are stcking out or are pulled back. Have the key in an empty slot in your inventory (its easier that way) and right click once it will say inserted or removed. now your tab end has the first tooth sticking out (inserted) or pulled back (removed) - now click on the door -if the message is that you have more teeth incorrectly placed then previously , then that first tooth is in the wrong position (each time you click on the door it resets your key) so - right click your key again - for instance if it was wrong and it was previously inserted you now need to remove the tooth, (clicking again quickly will reverse the tooth position) wait 5 secs and the next tooth in line will set when you right click the key. click the door again, message is less teeth incorrectly placed than previously means that the second tooth is also correct, rinse and repeat for each key. 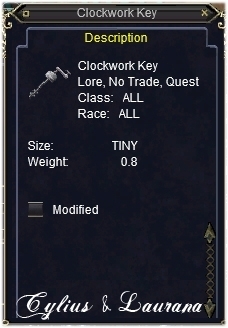 The key has 8 teeth in total. To enter the Mansion for the first time, you must correctly set them. Teeth can be either inserted or removed. You select teeth and choose whether they should be inserted or not by right clicking on the key in your inventory. Clicks close together will insert or remove a tooth. Clicks further apart (I was counting to 5) will allow you to move to the next tooth. And yes, this is just as frustrating as it sounds. is this part of a series to gain access to the Mansion? Quest reward for turning in three silver items to Gimblefixx in Dragonscale Hills.